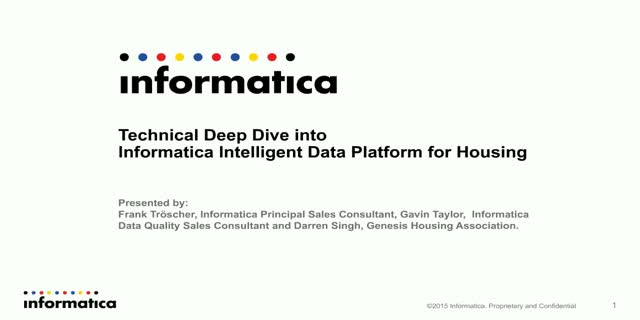 In this webinar learn about the technical capabilities of the Informatica Intelligent Data Platform for Housing and how it will help fuel your business success today, driving improved business operations, increased customer loyalty, and competitive advantage. Informatica IDP for Housing has been developed to support the implementation of a data governance framework to meet the changing needs and challenges of the modern Housing Association. • Learn how Informatica IDP will help housing association to address the data quality principles of Accuracy, Validity, Reliability, Timeliness, Relevance and Completeness. • Develop and build new content using a wizard driven interface.